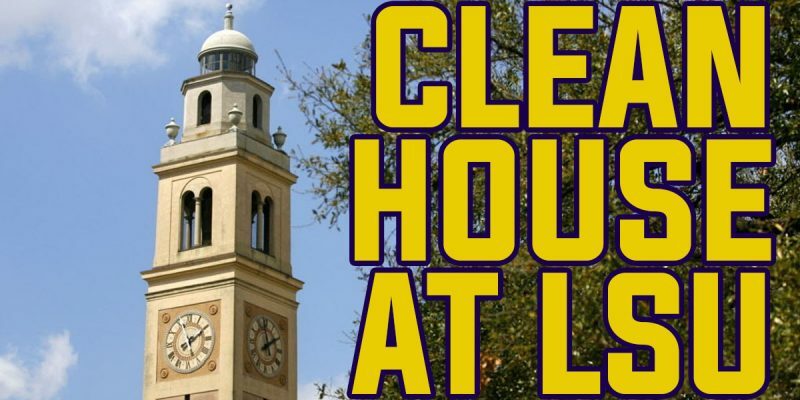 LSU “improperly compensated” a faculty member more than $400,000 in salary and benefits over a nearly three-year period despite the fact he later admitted he did not perform work for the university during that time, according to a new state audit. 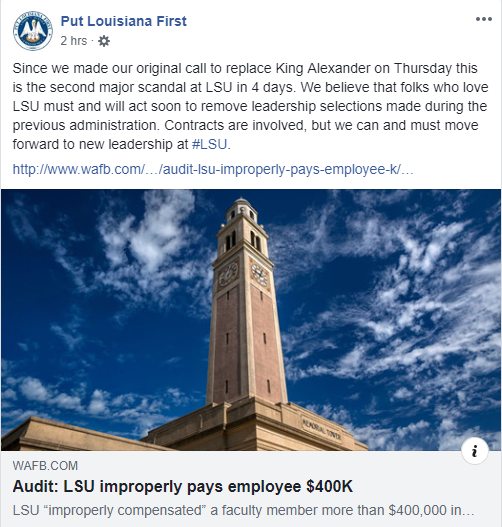 “The faculty member knowingly received 38 months of LSU salary and benefits without performing commensurate work,” auditors said in a report issued Monday by the Louisiana Legislative Auditor. Auditors say management at the School of Veterinary Medicine did not take “sufficient action to address the faculty member’s lack of performance.”LSU’s own internal auditors interviewed the faculty member, Fang-Ting Liang, and told state auditors he acknowledged he did not deserve to be paid. In its management response included in the state audit, LSU says the faculty member’s supervisor was removed as chair of the Department of Pathobiological Services and was replaced by an interim chair as result of the incident. LSU says it has “initiated disciplinary action” against Liang and pointed to its policy that permits LSU to dismiss faculty members ‘with cause’. Because that can be a lengthy process, LSU told auditors disciplinary action against Liang, whatever that might be, may not be complete until September 2019. “LSU employees are held to the highest standards, and these actions do not represent our mission and values,” LSU said in a statement to WAFB-TV Monday. We’re approaching some degree of inevitability here, amid the ongoing Will Wade standoff dominating local attention and making the competence of the folks running LSU a topic of conversation around the state, wherein stories like these and the continued tenure of F. King Alexander as LSU’s president become fodder for this fall’s statewide elections and particularly the gubernatorial campaign. At some point you’re going to start seeing Ralph Abraham and Eddie Rispone popping off about how giving Alexander an extension last year was a major mistake and that Alexander has to be sent packing, and it wouldn’t be much of a surprise to see them start liberally quoting Richard Lipsey, “John Bel Edwards’ former Board of Regents chairman,” talking about what a mess Alexander is. That is bound to happen at this point unless Edwards heads it off and starts making changes at LSU – or has his people on the Board of Supervisors do it. So far there is no evidence he’s ready to do that. Edwards, after all, backed the LSU brass in their decision to suspend Wade – something which wasn’t popular with LSU’s fan base. And if he’s true to form Edwards is going to respond to any criticism of Alexander by noting that he was hired under the previous administration. How much help that is for Edwards is questionable, though – the governor made copious use of Alexander as a shill for tax increases, and rewarded his work with that extension last year. One would have to form the impression that makes Alexander Edwards’ man regardless of who hired him, and that ownership would make Edwards the problem with poor leadership at LSU. Which is something that gets in the way of Lipsey’s message about how Alexander needs to go and it’s Edwards who needs to swing the axe. It’s not like stories like this won’t continue to surface. LSU is a mess at present. The Greek system is in shambles, old buildings are falling down as new ones are being built, there is a crime wave on the campus, alumni donations are down to a trickle and then there’s the basketball mess. Not to mention this business with the Our Lady of the Lake Foundation and whatever connection that might have to the management of the school. We won’t repeat the rumors we’ve heard, none of which are good. So far this stuff hasn’t made its way into the gubernatorial campaign. But it’s exactly the kind of thing that will.